Whether your plane’s been delayed, or you’re saving money by booking a flight with more than one layover, being stuck in an airport for a long layover is no one’s idea of a vacation. Just recently, I took a series of flights from Bogotá, Colombia to Phoenix, Arizona—with three layovers at three separate airports in between. These poses practically saved my life. Not only did they help my muscles de-cramp between flights, but the relaxing effects of these poses helped me stay peaceful when a never-ending customs line caused me to miss one of my connecting flights. Yoga can’t make sure your flight is on time, or that your luggage makes it from one plane to the other, but these 5 poses can help ease the frustrations of modern air travel. This pose is great for stretching out your legs, neck, back, and hamstrings after a long flight. As a simple inversion pose, it’s also a gentle way to get blood flowing to your upper body from your legs, where blood can pool after sitting for a long time—especially at 30,000 feet. This pose is often done sitting cross-legged on the floor, but if you’re stuck in an airplane seat or the floor is mysteriously sticky—as airport floors tend to be—you can modify this pose to be done from a chair. This pose is excellent for stretching the hard to reach muscles beneath your shoulder blades, and lifting your ribcage will help you take full, deep breaths. Doing Gomukhasana Arms from a chair can also help you realign your posture if you’ve been slouching. 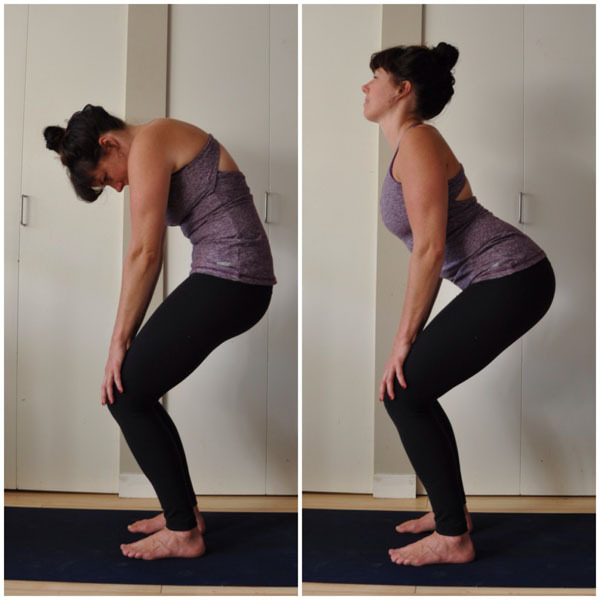 This pose requires no more space than you’d take up standing in the customs line, and the standing variation can provide an even deeper stretch in your tailbone. Bending your legs helps get the blood flow going again, while the alternation between Cat Pose and Cow Pose makes it incredibly easy to focus on your breathing, which will help you relax when your plane’s been delayed. Who doesn’t love a good twist, especially when you’ve been stuck in one place all day? This pose is perfect for realigning the spine and helping ease the tension built up in your back and hips. Focus on your pelvis to make sure you’re getting a really good twist, which will wring the tension right out of your body. This pose is great for lower back tension in particular. It’s a great alternative to Downward Dog when you don’t want to get your hands dirty on the questionably clean airport floor. This pose also boosts energy, so you’ll be able to make it through the last hours of your journey. The best part about these poses is that they can be done anywhere, even when you don’t have much space. Plus, they’re simple enough that even the most timid yogi won’t be embarrassed by public yoga. And if all else fails, you can always drift off in Savasana to help the time pass by.